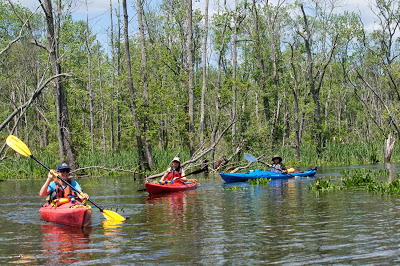 Celebrate Earth Day with a naturalist-guided paddle of The Great Swamp in neighboring Patterson, NY. The Great Swamp is a regionally significant wetland that is home to a wide diversity of plant and animal life, including threatened and endangered species. During our paddle, we are likely to see herons, kingfishers, painted turtles, beautiful dragonflies and perhaps a beaver or otter, among other wildlife. Check out this fantastic video produced by the Friends of the Great Swamp and narrated by James Earl Jones to learn more about this special place. The paddle will be fairly easy and last approximately 2 hours round-trip. Attendees are encouraged to bring their own canoe or kayak if they have one. A limited number of canoes can be provided upon request. Attendees should have previous paddling experience and be comfortable operating their boats without any instruction or assistance. PFDs (life vests) are encouraged and you should bring your own if you have one. Please email John Foley to register or request additional information. Please note in your email how many people will be in your party and whether you will or will not need to borrow a canoe/kayak. Space is very limited. Open to people ages 13 and up. A suggested donation of $25/person for non-members and $15 per person for members is greatly appreciated. We will meet at 10am in the Green Chimneys parking area on Doansburg Road in Brewster NY. Light snacks and water will be provided, but attendees are also encouraged to bring their own if they would like.